Most people equate retirement planning with a 401(k) or saving money for the future. While a retirement without money doesn't sound like much of a retirement, focusing exclusively on the monetary aspects of the planning is missing the big picture. A happy retirement is about so much more than having enough money to pay your bills. So once you have a retirement plan in place to help secure your financial future, be sure that you also consider the non-financial aspects of a successful retirement. If you're like retirees who have taken the time to make the conversation about more than just money, you might define a successful retirement as a happy one. So let's take a lesson from the life stories of the happiest retirees. Some of the happiest and most content retirees have a few things beyond financial security in common. Work in retirement? But don't we work our entire adult lives for the privilege of not working in retirement? It sounds counter-intuitive but studies have shown that people who voluntarily continue to work, even just part-time, past the age of 65 are happier than their full retired peers. The key word here is voluntary. The effect on the level of happiness is the opposite when retirees are forced to work for financial reasons. While picking up a part-time job in retirement can benefit you financially, its advantages far outweigh the extra pocket money. The physical activity, social interactions, and even a sense of purpose gained from work all do wonders for retirees' physical and mental health, which as we know are important factors in overall happiness and contentment. Relationships both romantic and platonic are an incredibly important part of an enjoyable retirement. Married retirees who report their relationship with their spouse as good or great are reportedly happier than their single counterparts. When people retire, many lose their built-in social network of colleagues and acquaintances. To have a happy retirement, find ways to have social interactions. These interactions can be with your children and grandchildren, neighbors, members of a social club or church, or even the guy at the coffee place. Retire with the intention to maintain your most important relationships. Not only will the effort make for a happier retirement, but recent studies have suggested that loneliness can result in higher risk of developing Alzheimer's and other dementia-related diseases. Many people forget to ask themselves how they are going to spend their time in retirement. Good financial planners will ask their clients this question as a way to help gauge what kind of discretionary income to save for (greens fees and plane tickets come at a cost! 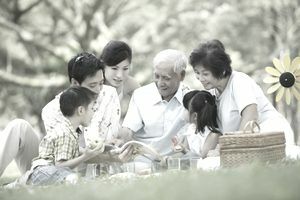 ), but people planning for their retirement need to think beyond the financial considerations. For decades, you've spent the lion's share of your waking hours at work and maybe even raising children. In retirement, that enormous time commitment will evaporate. How will you fill your days? Will it be on the golf course? Playing tennis? Doing volunteer work? Taking care of your grandchildren? Traveling? Learning to cook? Joining a book club? Busy retirees tend to be happier retirees. One study showed that the happiest retirees engage in three to four regular activities and the retirees with the busiest schedules tended to be the happiest. So while retirement can certainly be a time to relax, it should also be a time do the things you enjoy. The importance of your health when it comes to your happiness can't be overstated. In fact, in a recent study, having good health was outranked financial security as the most important ingredient for a happy retirement, but the two are more intertwined than you might think. Health is both a financial and non-financial issue since significant medical expenses can put major stress on an otherwise solid financial plan. Not to mention, constant hospital and doctor visits aren't the same as laying out at the beach or hitting the golf course. While you can't predict health concerns, the best step is preventative. Be sure to take care of yourself both now and in retirement. Eat well, exercise, and don't neglect your physical or mental health. While financial security is a key ingredient for a successful retirement, be sure not to neglect the other non-financial considerations that make for a happy retirement.